Chelsea has Cerebral Palsy and needs to use a walking frame for support. Unfortunately, her frame did not provide an adequate level of support that would encourage and facilitate walking. 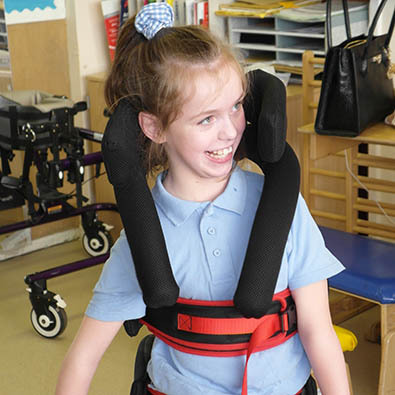 Our team designed and fitted a headrest and cross body support which enables Chelsea to properly benefit from her muscle therapy and to be included in other activities with her family and friends. Our practical solutions, developed under the guidance of qualified health professionals, tackle much more than frustrations with the equipment; influencing the children’s sense of self, their confidence and wellbeing.